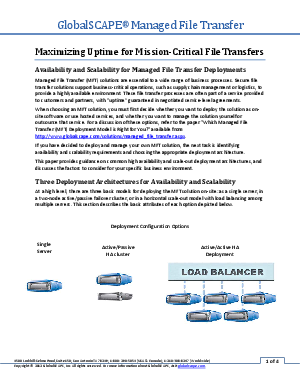 This whitepaper provides guidance on common high-availability and scale-out deployment architectures, and discusses the factors to consider for your specific business environment. Three basic models are described for deploying an on-site managed file transfer (MFT) solution. The attributes of each option are described; each has pros and cons and offers a different balance of cost, complexity, availability, and scalability. The paper explains that, no matter how reliable each model is, any deployment can experience outages. The recommendation is to use clustering services to protect your data when the inevitable hardware, software, or network failures occur.